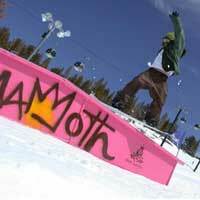 Mammoth is a riders paradise and the handy work of many of our local heroes and freestylers. 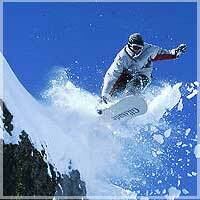 Snowboard at Mammoth Mountain has accelerated rapidly with the invention of twin tip skis, and our very famous team riders. The mountain has some rad parks set up for you to master your air and tricks and is also working with June Mountain to create a secret haven for riding. The Unbound Park features rails galore, table tops, arcs and trenches, bumps and rolls, and two pipes. The smaller park on Chair 4, Rollercoaster, is a cool place to practice before you start mingling with the Big Boys, and are exposed to the hoots and hollers of Chair 6 which passes overhead. You can see the entire park on the trail map. If you like to ride as a racer, than the long runs of St. Anton, and Fascination and Far West are great off of Chair 1. Carvers will want to make your own terrain, from the back of Chair 3 and hit Gremlin's Gulch just below the Cornice. Follow it to Chair 12 and try the face runs for some freshies that are hardly untouched...all the time. Just Below Chair Five is Dry Creek where many riders make their way through the canyon and stop for a breather in the cave. Want another challenge? Try Scotty's, Wipeout, Climax, or if you really want to make your heart race, go over the edge on Dave's Run. The runs are Black and Double Black Diamond and holding an edge will give you a unbelievable ride with the steeps being so close you can drag your hand on the wall. Check out extreme photo gallery of pictures folks send us. The Unbound Terrain Park continues to lead the standard for all parks. Pro Olympians have added their feedback to the design and making of this one, and a place to dance on you board when you free ride. Our own Tommy Czeschin, Rory Silva, Kevin Jones, Tara Dakides, and Phil Belanger live and train in Mammoth, making the new branded "Vans" Unbound a top place to board. Filled with a Superpipe, gaps, tabletops, spines and a bus to grab some grub. Call it Super pipe amplitude! 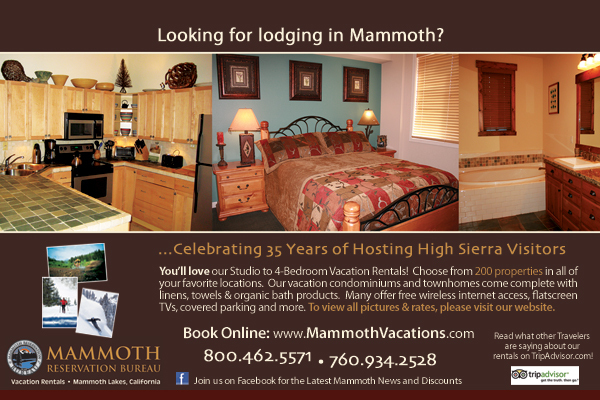 If you're planning a trip and we can help you with lodging, give us a call. That's why we're here, and we always have some kind of specials running as well. These businesses can help with this adventure!